The Canadian Northwest Territory is a vast wild region stretching from Yukon in the west to the Arctic Ocean in the north and Hudson Bay in the east. It is nature in its purest state, an adventurer’s dream, a paradise for photographers and travellers in search of the endless horizon. I have travelled in the Northwest Territory as much in winter as in summer, particularly the northern part of the Great Slave Lake region, bordering the Northwest Passage, which I have traversed in winter over the pack ice. 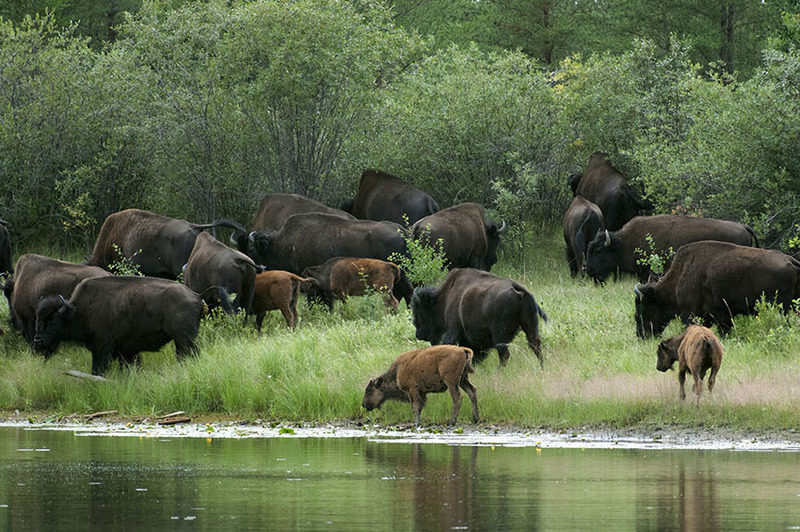 I propose that you accompany me on an adventure at the end of autumn in the Wood Buffalo reserve, between Fort Smith and Peace River, where we might see, for example, the last wood buffalo. It takes many hours in a 4×4 vehicle to cross this reserve from north to south. At this time of year, nature appears to us in the most beautiful colours. The red of wild berries mixes with the yellows and oranges which make up the glorious foliage of the bushes and shrubs. It is also at this time of year, when the days are getting shorter, that we have the best chance of observing one of the most extraordinary spectacles of nature: the aurora borealis. If the solar activity allows it, dusk and the night clearly provide the best moments to see and photograph this phenomenon. The Northwest Territory also benefits from a dry continental climate. This increases the chances of seeing the aurora, compared with conditions in northern Europe, which is often swaddled in clouds coming from the Atlantic.